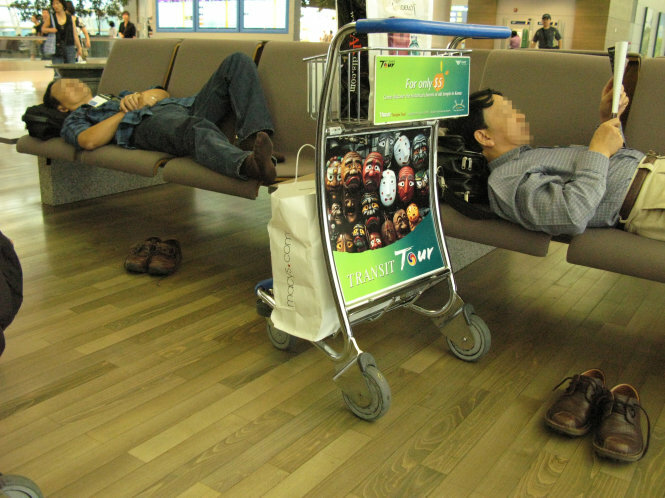 Tired passengers take a rest while waiting for their transit flight to the U.S. While Vietnam Airlines has fulfilled its requirements to begin offering direct flights to the U.S., the wait for its inaugural flight will continue until at least the end of September, with the country’s aviation watchdog said to be to blame. In 2003, Vietnam and the U.S. closed an aviation agreement, allowing airlines to begin nonstop services between the two countries. Vietnamese passengers were happy with the news, hoping to soon be able to fly directly to the U.S. with a local airline, ending the days of additional time spent transiting with foreign carriers. National flag carrier Vietnam Airlines has since exerted efforts to meet all the necessary standards and requirements to begin offering the direct service. However, the launch of the much anticipated flight is yet to clear one last barrier: the Civil Aviation Authority of Vietnam (CAAV) does not meet the safety assessment standard as required by the U.S. Federal Aviation Administration (FAA). The FFA conducts the International Aviation Safety Assessment Program (IASA), assessing the civil aviation authority (CAA) of any country that has carriers flying to the States. An IASA assessment determines if the foreign CAA provides sufficient oversight on carriers that operate in the U.S., and in accordance with international standards developed by the International Civil Aviation Organization (ICAO). A qualified CAA is granted a Category 1 rating, whereas those who do not meet the standards are given a Category 2 rating. At present the CAAV remains a Category 2, meaning a nonstop Vietnam-U.S. flight will not be launched until the Vietnamese aviation watchdog achieves a higher rating. In 2015 the CAAV closed an agreement with Boeing, guaranteeing that it would achieve the FAA Category 1 rating within the last quarter of that year. However, the deadline was later postponed to the third quarter of 2016. It was not until May of this year that the FAA completed its final inspection into CAAV operations to determine whether its rating should be improved. Dinh Viet Thang, head of the CAAV, told Tuoi Tre (Youth) newspaper on Sunday that the aviation authority has met all ICAO standards. The CAAV chief asserted that his authority had been well prepared for the final test and he is confident that it will be able to achieve a Category 1 rating this time. In the meantime, Vietnam Airlines CEO Duong Tri Thanh confirmed to Tuoi Tre that the carrier had filed an application to launch the Vietnam-U.S. route to the U.S. Department of Transport. Once the CAAV receives the Category 1 rating from the FAA, Vietnam Airlines will start developing detailed schedules for the new direct flight Thanh said, adding that the expected launch is now 2019. The national flag carrier currently operates seven flights to the U.S. under codesharing agreements with other airlines. A flight including one transit stop takes around 17 hours, while those that include two stops and require airport changes can take between 25 and 38 hours. According to its 2016-20 business plan, Vietnam Airlines wants to open a direct flight to the U.S. West Coast, most likely San Francisco or Los Angeles. The service will have one hour-long technical stop in Tokyo or Osaka, where the plane will be refueled and receive in-flight food supply that will not require passengers to leave the aircraft.